CAREY, Ohio — A solar installer whose headquarters building has its own sun-powered system and the largest solar farm in Ohio, which spans an area equal to some 80 football fields, are two of the highlights of the 2015 Renewable Energy Workshop. The event, which is sponsored by the College of Food, Agricultural, and Environmental Sciences at The Ohio State University, is from 9 a.m. to 3 p.m. Nov. 4 at Vaughn Industries, 1201 E. Findlay St. in Carey in northwest Ohio. “It’s for anyone interested in renewable energy, such as farmers, homeowners, small-business owners, financial and insurance companies, researchers and students, and state and local agency personnel,” said Yebo Li, the event’s organizer and a biosystems engineer with the college. Speaking will be renewable energy experts from the college and industry, including on such topics as solar energy, funding possibilities, growing grasses to make biofuels, and producing bioenergy through anaerobic digestion of manure and plant matter. The Vaughn Industries’ headquarters building, which runs a 50-kilowatt solar system. The specialty contracting company has installed solar systems ranging from 1 to 15 megawatts at sites from Ohio to North Carolina. 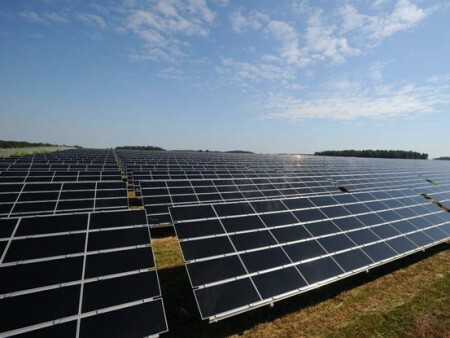 PSEG Solar, an 83-acre solar field in Wyandot County that has nearly 160,000 solar panels on more than 3,000 fixed-tilt solar arrays. The 12-megawatt farm produces enough electricity for more than 9,000 homes when the sun is shining. Registration is $40 by Oct. 27, $50 after that date, and includes continental breakfast and lunch. Registration for college students is $20. Transportation to the workshop site and the PSEG farm will be by the participants’ own vehicles or by a free vanpool ride leaving at 7 a.m. from the college’s research arm, the Ohio Agricultural Research and Development Center in Wooster in northeast Ohio. Space in the van is limited; reserve a space when registering. To register, download and fill out the registration form available at go.osu.edu/2015REW and return it with payment. Or send your name, contact information and check for payment — payable to OARDC/OSU — to Mary Wicks, OARDC/OSU, 1680 Madison Ave., Wooster, OH 44691. Indicate if you’d like a spot in the vanpool from Wooster and whether you have any dietary restrictions. Professional Engineer continuing education credits should be available to participants but the details are still to be confirmed. For more information, contact Wicks at wicks.14@osu.edu or 330-202-3533 or go to go.osu.edu/2015REW. The college’s outreach arm, Ohio State University Extension, co-sponsored a workshop on how solar energy can save farmers money on Oct. 1 in northeast Ohio. A press release about the event is at go.osu.edu/BA59.